From the first steam powered vehicle that entered the park in 1900 through the recent struggle over the Merced River Plan, there is perhaps no more divisive an issue in Yosemite’s history than the allowance of automobiles within the park. Too many, automobiles are a menace that pollute the air, clog the park’s narrow roads, seemingly unending headaches for visitors just looking to park, and ruin Yosemite’s natural grandeur. However, it is indisputable that cars democratized national parks in ways inconceivable at the beginning of the twentieth century. And herein lay the inherent conundrum of automobiles. While they allow millions to experience Yosemite’s beauty, thus democratizing our national park, they change our shared understanding of that beauty, which can place automobiles at odds with our broader understanding of what Yosemite should be. By 1922, nearly 65 percent of Yosemite visitors drove their own private vehicle into the park, with the majority of those coming from California’s burgeoning metropolises of San Francisco and Los Angles. The Park Service heartily welcomed such visitors, and rushed to build new roads and scenic overlooks that continue to frame visitor’s understandings of Yosemite through today. Yet, every year the park receives thousands of complaints such as, “I’m an avid hiker and love the Yosemite Valley. Please DO NOT create more roads, more access and more ways for people to visit that should not be there in the first place.” Such calls to shut cars out of Yosemite are not new, and in fact stem back to the first automobile to enter park. Yosemite’s struggle over automobiles began in 1900 when Los Angeles photographer Oliver Lippincott drove his Locomobile over the “dusty, steep, narrow and rough” Wawona Road into the Yosemite Valley. Cars were a novelty at the time, and the small steam powered vehicle was no exception with Lippincott’s leisurely drive around the valley, and posing for a photograph by driving out onto Glacier Point attracting national attention. 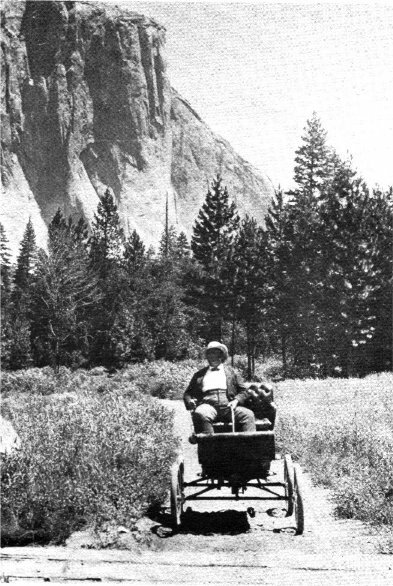 Despite Yosemite’s lack of adequate roads, and most automobiles rather limited reliability of the time, the number of tourists venturing into the park grew steadily until 1907, when acting superintendent Major Harry C. Benson banned all automobiles fearing that cars might scare horses, causing life-threatening accidents on the park’s steep, narrow roads. Naturally, Major Benson’s decision drew both widespread praise and condemnation. Among the most outspoken proponents of the ban were the Washburn brothers. The two had moved from Vermont to California in 1876, and opening a small stage stop near the Mariposa Grove that soon grew into the Wawona Hotel. Within the six years, the brother’s operation had grown to include the construction of toll road, known as the Wawona Road, which connected the burgeoning hotel with the Yosemite Valley, and the Yosemite Stage and Turnpike Company. Like Hutchings before them, the Washburn’s served a very affluent clientele prior to the advent of car tourism in the 1910s. Holding a monopoly on access to the Yosemite Valley via the Wawona Road, the brothers had little interest in opening access to automobiles, even if it meant an increase in tolls. It was with this in mind the older of the two, E.P., penned his letter to Major Benson voicing his support of the ban citing his fear that the vehicles would frighten or injure the horses which drew the stage between the hotel and Valley that drove his support. Hand-drawn map of existing and proposed roads within Yosemite National Park. In hindsight, such fears seem rather short sighted. After all, the automobile would become ubiquitous in American life within a decade. But to the Washburn brothers and Major Benson such vehicles appeared to be little more than a new technological fad that threatened established understandings on how to tour Yosemite. Despite such views, the ban did not last for long. By the 1910s increased national ownership of automobiles combined with efforts such as the good roads campaign in leading to a public outcry to open Yosemite to cars. Realizing this new reality Secretary of the Interior lifted the ban in 1913, democratized Yosemite and transforming the park into the windshield wilderness so familiar today. Warnings such as Bryce’s foreshadowed the increasing debate over automobiles within Yosemite. Within a few years of lifting the automobile ban, park managers began to struggle with a myriad of issues, from a lack of adequate infrastructure to pollution, caused by growing number of visitors, a struggle that continues to bedevil Yosemite as millions continue to venture into the park by car. Very interesting! Can you tell me where you found the image of the letter? 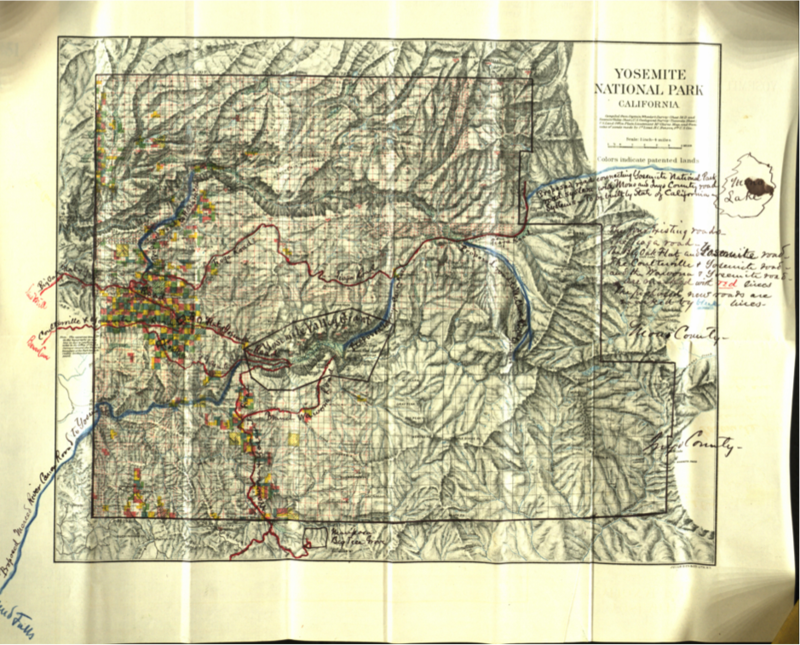 Tracy, in the Yosemite National Park Archives.